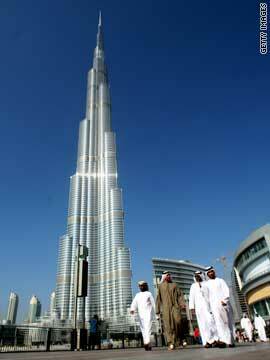 Burj Dubai is the extremely tall centerpiece of an ambitious development in Dubai, United Arab Emirates. (CNN) -- Things are looking up in Dubai. Way, way up. The Arab emirate's colossal, multibillion-dollar skyscraper, Burj Dubai, opened for business Monday, stretching 168 stories and 2,684 feet into the desert sky. The "At the Top" observation deck, at the 123rd floor, isn't really at the top, but it's plenty high enough. "No question, the tower is going to be a huge draw for people who want to get up there," said George Efstathiou, Burj Dubai's lead architect and managing partner for the Chicago, Illinois, architecture firm Skidmore, Owings & Merrill. Burj Dubai is so tall, according to SOM, that the outside air temperature at the top can be as much as 15 degrees cooler than at ground level. So, if you're uncomfortable in Dubai's 120-degree summer heat and can't get a ticket to the emirate's famous indoor ski resort, just head up to the top of Burj Dubai, where you can cool off at a relatively chilly 105 degrees. Counting the spire and its podium together, Burj Dubai contains 5 million square feet of floor space, which Efstathiou points out is actually less than Chicago's Willis (formerly Sears) Tower, the former champion that now ranks No. 5 in the world. Its design inspired by a desert flower, Burj Dubai is built in a "Y" footprint with three wings; each buttresses the others. At the center is a six-sided concrete hub tying it all together. Tall buildings move when the wind hits them, but SOM -- led by Efstathiou, former consulting design partner Adrian Smith and engineer William F. Baker -- designed Burj Dubai to shrug off desert winds. "The building is tuned to sway slowly so your middle ear doesn't pick it up," Efstathiou explained. "They tune it just like a musical instrument so that the harmonics of the building don't coincide with the harmonics caused by the wind. ... We tune it so that on the floors where people are going to be, you don't feel it that much." That will be welcome news to guests at the tower's seven-star Armani Hotel, with its 160 guest rooms and suites across 10 stories. The 430,000-square-foot hotel, designed and furnished by Italian fashion designer Giorgio Armani, features eight restaurants, a spa, swimming pool, library, fitness center and business center, as well as 30,000 square feet of conference and banquet space on "mirror-smooth marble floors," according to the Armani corporate Web site. Armani also has 160 permanent residence suites in the tower, along with a number of high-end shops and boutiques. Measured to the architectural top of the building, which includes spires but does not include antennas, signs, flagpoles or other functional-technical equipment. 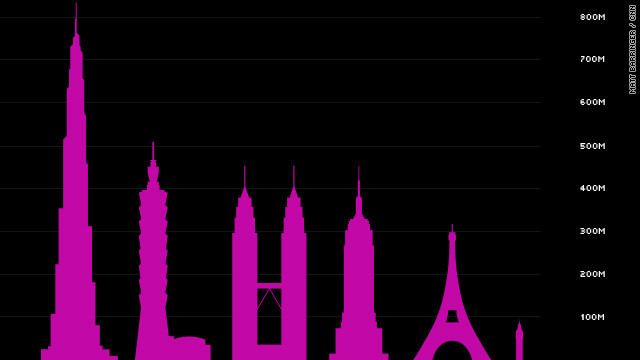 This measurement is the most widely used for ranking tall buildings. Measured to the highest continually occupied floor within the building. Maintenance areas are not included. Measured to the highest point of the building, including antennas, flagpoles, signs and other functional-technical equipment. Burj Dubai is the extremely tall centerpiece of a massive development that includes five hotels, a huge shopping mall, at least 150 restaurants and 1,200 shops. Entertainment options include the ski resort, an Olympic-size ice skating rink, a 4.6 million-gallon walk-through aquarium, a SEGA game theme park and KidZania, an 80,000-square-foot play village for children. Set in a 30-acre lake that seems incongruous if not impossible in the Arabian desert is the 900-foot-long Dubai Fountain, with nozzles that shoot 22,000 gallons of water as high as a 50-story building. It was designed by the same company that built the fountains at the Bellagio in Las Vegas, Nevada. "This is Las Vegas on steroids," said Terry Mock, executive director of Sustainable Land Development International, an organization that promotes development that balances economic, environmental and societal goals. Burj Dubai is a symbol of unsustainable development, Mock said, adding that the emirate's recent economic bailout by neighbor Abu Dhabi is proof that Dubai is going about it the wrong way. Dubai lacks the oil resources of its neighbors, Mock said. He wonders how the emirate will produce the millions of gallons of fresh water its developments -- including its famous palm tree-shaped artificial islands -- require every day. Where will it produce electricity in the future? Where does its garbage go, he wondered. "I'm certainly not suggesting they ought to tear the building down, but there are ways to make these structures more sustainable," he said. For starters, Mock suggested retrofitting the tower's 24,348 glass panels with a film to let them double as solar panels. Contracts and agreements would have to be reworked to address economic and societal issues over time, he said. "Dubai should have a tourism base, but those [physical, economic and societal] structures still need to follow certain guidelines, certain principles of sustainability," he said. "Otherwise, you're just building on quicksand." Efstathiou, the architect, counters that the development does employ a measure of green design. The entire Burj district -- tower, mall, hotels, restaurants -- shares a single cooling system, bringing significant energy economies, he said. Also, engineers took advantage of Dubai's torrid heat and humidity by having the skyscraper's chilled-water piping double as a condenser to produce thousands of gallons of fresh water for irrigation, he said. "All the water in that area is desalinated water, so extracting it from the air in that way is a very sustainable kind of thing to do, and it also helps us keep our site nice and green," said Efstathiou, who estimates that he has traveled between Chicago and Dubai 70 or 80 times since 2003. 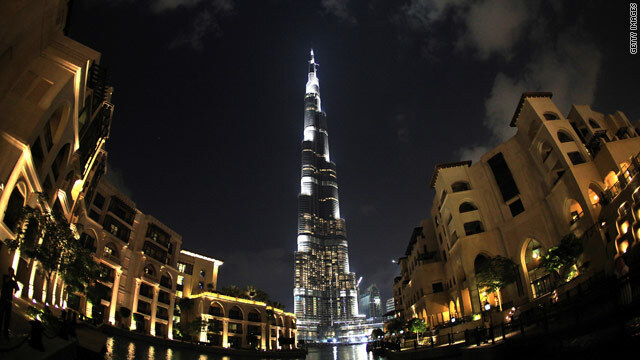 Other skyscrapers are in the planning stages in various places throughout the world, but Burj Dubai's standing as the world's tallest isn't likely to be challenged soon, given the state of the world economy, Efstathiou said. "Sears Tower held the record for 20 years, I think, and the pyramids held it for 400 years, so who knows?"